Touch Football Competition returns to the City Of Melton. 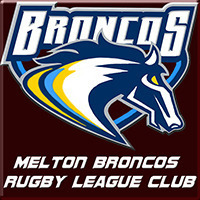 The Melton Broncos Touch Committee's aim is to provide a competition that allows the whole family to participate. And to ensure that the competition is safe, fair and most of all enjoyable! Melton will host a open day to register and have a friendly run at our current winter grounds (Mt. Cottrel Reserve, Exford Rd). These will be informal matches giving you a chance to get the ball in your hands and familiarise yourself with the game of Touch register your teams and pay for your players Saturday 26th September from 10am to 3pm. The junior season (Under 10's - 17) will start on Monday October 12th and run through until April 2016. Senior Matches will be on Friday nights and will be a mixed competition (min. 1 Male and Max 3 on the field at any time). Season fees will be $150 per Player. full payment due by round 1.